Rohit Sharma hailed team effort after India dismantled Windies in the fifth and final ODI on Thursday to seal the series 3-1. The Men in Blue ended the five-match series against Windies in the same manner or rather far better manner they had started the series. In the first match of the series, India had chased down 323 inside 43 runs to thrash Windies by eight wickets. The performance in the following two games were not up to the mark as Windies tied the second game before winning the third. But just when it mattered the most, all the players rose to the occasion. In the fourth game, India thrashed the visitors by 224 runs. Virat Kohli, who had scored centuries in the first three ODIs, was out cheaply. But Rohit Sharma and Ambati Rayudu had scored centuries to guide India to 377 for 5. The bowlers then joined the party by folding up the Windies outfit for just 153. The hosts did even better in the fifth game. Barring the toss, everything went India’s way. 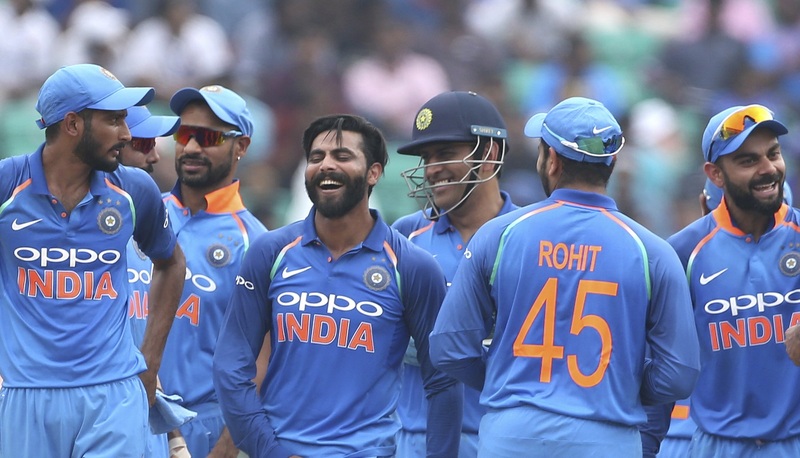 Jason Holder’s decision to bat against their fancied opponents turned out to be a poor decision as the Virat Kohli-led side bowled out their opponents for a paltry 104. With the ball swinging early on, Jasprit Bumrah and Bhuvneshwar Kumar gave their side a dream start. Kieran Powell edged one from Kumar behind the stumps to depart for a duck. Bumrah then sent back Shai Hope packing in the next over to leave Windies reeling at 2-2. Marlon Samuels and Rovman Powell tried to steady the ship before Ravindra Jadeja accounted for the former to derail Windies’ innings. Jadeja also dismissed the dangerous Shimron Hetmyer to put India on top. Khaleel Ahmed then accounted for makeshift opener Rovman Powell and Jason Holder to reduce the visitors to 87 for 7. Jadeja ran through the lower-order as the home side bowled out the tourists for 104 in 31.5 overs. In reply, the Men in Blue were off to a poor start with Shikhar Dhawan once again failing to deliver. However, Rohit Sharma and Virat Kohli stitched together an unbeaten partnership of 99 runs to take India home. Rohit, who already had two centuries to his name in the series, went on to compile a fine fifty while Kohli played the role of the second fiddle.